What Should Texas do About Border Security? Don't Ask Bill White! 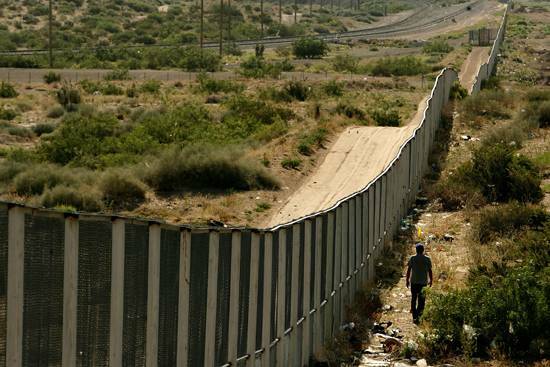 In the wake of cross-border killings and kidnappings, increasing drug violence in Mexico and the threat of international terrorism, the nation is embroiled in a debate over border security and immigration reform. As a border state, Texas has long been at the forefront of border issues. Texans deserve straight, honest answers from those who seek to lead us, so it's fair to ask Democratic gubernatorial nominee, former Houston mayor Bill White, what he thinks about border and immigration issues. A concerned Texan recently did just that. Here is the Bill White campaign's response. Thank you for your e-mail to Bill White for Texas! I am a volunteer on the campaign and I help Bill with his email. In reference to your question, Bill, like you, is concerned about the appropriate way to handle issues of immigration in Texas given our proximity to the border. During his years as mayor of the city of Houston, Bill instituted two new programs that served to tighten controls on illegal immigrants in the city of Houston in order to improve safety and opportunity for all Texas citizens. One of these programs, Secure Communities, identified illegal alien criminals serving sentences in the city jail and deported them upon the completion of their sentences. The other program, E-verify, was used to ensure that all of the employees working for the city were authorized to work in the United States. Secure communities worked to ensure that illegal aliens threatening the safety of our communities were no longer able to reside in Houston, and E-Verify worked to ensure that city jobs were available to those who have the right to hold them. Nonetheless, it is important to note that ultimately immigration law and border security are national issues, and that the governor’s ability to enact change in these respects is limited. Nonetheless, Bill White will continue to work hard to maintain the safety of Texans, cracking down on the entry of violent criminals, drug traffickers, and human traffickers through the use of modern technology and smart access systems. Thank you again for taking the time to contact us with your questions and concerns. "The Bill White campaign is turning into a 'Magic 8 Bill' - you ask a straightforward question and get a vague response that doesn't quite answer what you asked," said Republican Party of Texas spokesman Bryan Preston. "The fact is, under Bill White's leadership Houston was a sanctuary city. That's liberal Bill White's legacy in Houston, and Texas doesn't need that. We need strong security and we need the federal government to do its job and enforce the laws that are already on the books. Bill White is just another liberal Democrat playing cynical politics with our state and national security." FACT: The U.S. Department of Justice defines sanctuary cities as “jurisdictions that may have state laws, local ordinances, or departmental policies limiting the role of local law enforcement agencies and officers in the enforcement of immigration laws.” Houston meets the Justice Department’s definition of “sanctuary city” because of the Houston Police Department’s General Order 500-5, which states “Unlawful entry into the United States is not a matter to be treated as an on-going offense occurring in the presence of a police officer,” and, "Officers shall not make inquiries as to the citizenship status of any person, nor will officers detain or arrest persons solely on the belief that they are in this country illegally." FACT: Bill White consistently brushed aside repeated calls from the Houston community and other elected officials to get tougher on immigration law enforcement and lift General Order 500-5. Bill White even fought repeated calls from Houston police officers to end sanctuary policies. He refused to listen to his own law enforcement agents. FACT: In the above email, Bill White suggests the use of "smart fence" technology to control border security. But leaders in his own party in Washington, including President Barack Obama, recently halted construction on the so-called "smart fence" and Bill White said and did nothing about it. He failed to stand up for Texas. "Bill White is trying to hide his liberal ways by giving Texans non-answer after non-answer on important issues," added Preston. "But he can only hide for so long. Texans won't stand for liberal Bill White's misdirections forever."